Samarium is a chemical element with symbol Sm and atomic number 62. It is a moderately hard silvery metal that readily oxidizes in air. Being a typical member of the lanthanide series, samarium usually assumes the oxidation state +3. Compounds of samarium(II) are also known, most notably the monoxide SmO, monochalcogenides SmS, SmSe and SmTe, as well as samarium(II) iodide. The last compound is a common reducing agent in chemical synthesis. Samarium has no significant biological role and is only slightly toxic. Samarium was discovered in 1879 by the French chemist Paul Émile Lecoq de Boisbaudran and named after the mineral samarskite from which it was isolated. The mineral itself was earlier named after a Russian mine official, Colonel Vasili Samarsky-Bykhovets, who thereby became the first person to have a chemical element named after him, albeit indirectly. Although classified as a rare earth element, samarium is the 40th most abundant element in the Earth's crust and is more common than such metals as tin. Samarium occurs with concentration up to 2.8% in several minerals including cerite, gadolinite, samarskite, monazite and bastnäsite, the last two being the most common commercial sources of the element. These minerals are mostly found in China, the United States, Brazil, India, Sri Lanka and Australia; China is by far the world leader in samarium mining and production. The major commercial application of samarium is in samarium-cobalt magnets, which have permanent magnetization second only to neodymium magnets; however, samarium compounds can withstand significantly higher temperatures, above 700 °C (1,292 °F), without losing their magnetic properties, due to the alloy's higher Curie point. 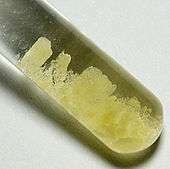 The radioactive isotope samarium-153 is the major component of the drug samarium (153Sm) lexidronam (Quadramet), which kills cancer cells in the treatment of lung cancer, prostate cancer, breast cancer and osteosarcoma. Another isotope, samarium-149, is a strong neutron absorber and is therefore added to the control rods of nuclear reactors. It is also formed as a decay product during the reactor operation and is one of the important factors considered in the reactor design and operation. Other applications of samarium include catalysis of chemical reactions, radioactive dating and an X-ray laser. Samarium (and its sesquioxide) are paramagnetic at room temperature. Their corresponding effective magnetic moments, below 2µB, are the 3rd lowest among the lanthanides (and their oxides) after lanthanum and lutetium. The metal transforms to an antiferromagnetic state upon cooling to 14.8 K. Individual samarium atoms can be isolated by encapsulating them into fullerene molecules. They can also be doped between the C60 molecules in the fullerene solid, rendering it superconductive at temperatures below 8 K. Samarium doping of iron-based superconductors – the most recent class of high-temperature superconductors – allows to enhance their transition temperature to 56 K, which is the highest value achieved so far in this series. Numerous crystalline binary compounds are known for samarium and one of the group-4, 5 or 6 element X, where X is Si, Ge, Sn, Pb, Sb or Te, and metallic alloys of samarium form another large group. They are all prepared by annealing mixed powders of the corresponding elements. Many of the resulting compounds are non-stoichiometric and have nominal compositions SmaXb, where the b/a ratio varies between 0.5 and 3. The alpha-decay of 147Sm to 143Nd with a half-life of 1.06×1011 years serve for samarium-neodymium dating. 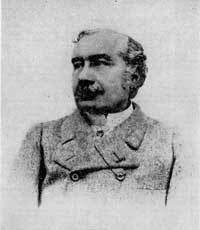 Boisbaudran named his element samaria after the mineral samarskite, which in turn honored Vasili Samarsky-Bykhovets (1803–1870). Samarsky-Bykhovets, as the Chief of Staff of the Russian Corps of Mining Engineers, had granted access for two German mineralogists, the brothers Gustav Rose and Heinrich Rose, to study the mineral samples from the Urals. In this sense samarium was the first chemical element to be named after a person. Later the name samaria used by Boisbaudran was transformed into samarium, to conform with other element names, and samaria nowadays is sometimes used to refer to samarium oxide, by analogy with yttria, zirconia, alumina, ceria, holmia, etc. The symbol Sm was suggested for samarium; however an alternative Sa was frequently used instead until the 1920s. 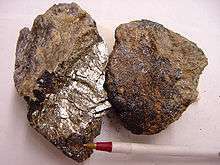 The analysis of relative concentrations of samarium and neodymium isotopes 147Sm, 144Nd, and 143Nd allows the determination of the age and origin of rocks and meteorites in samarium-neodymium dating. Both elements are lanthanides and have very similar physical and chemical properties. Therefore, Sm-Nd dating is either insensitive to partitioning of the marker elements during various geological processes, or such partitioning can well be understood and modeled from the ionic radii of the involved elements. 1 2 3 4 Shi, N; Fort, D (1985). "Preparation of samarium in the double hexagonal close packed form". Journal of the Less Common Metals. 113 (2): 21. doi:10.1016/0022-5088(85)90294-2. ↑ Lock, J M (1957). "The Magnetic Susceptibilities of Lanthanum, Cerium, Praseodymium, Neodymium and Samarium, from 1.5 K to 300 K". Proceedings of the Physical Society. Series B. 70 (6): 566. Bibcode:1957PPSB...70..566L. doi:10.1088/0370-1301/70/6/304. ↑ Huray, P; Nave, S; Haire, R (1983). "Magnetism of the heavy 5f elements". Journal of the Less Common Metals. 93 (2): 293. doi:10.1016/0022-5088(83)90175-3. ↑ Okazaki, T; Suenaga, Kazutomo; Hirahara, Kaori; et al. (2002). "Electronic and geometric structures of metallofullerene peapods". Physica B. 323: 97. Bibcode:2002PhyB..323...97O. doi:10.1016/S0921-4526(02)00991-2. ↑ Chen, X.; Roth, G. (1995). "Superconductivity at 8 K in samarium-doped C60". Physical Review B. 52 (21): 15534. Bibcode:1995PhRvB..5215534C. doi:10.1103/PhysRevB.52.15534. ↑ Wu, G.; Xie, Y L; Chen, H; et al. (2008). "Superconductivity at 56 K in Samarium-doped SrFeAsF". Journal of Physics: Condensed Matter. 21 (14): 142203. arXiv:0811.0761 . Bibcode:2009JPCM...21n2203W. doi:10.1088/0953-8984/21/14/142203. 1 2 3 4 5 6 7 8 Emsley, John (2001). "Samarium". Nature's Building Blocks: An A–Z Guide to the Elements. Oxford, England, UK: Oxford University Press. pp. 371–374. ISBN 0-19-850340-7. 1 2 3 4 5 6 Hammond, C. R. "The Elements". Handbook of Chemistry and Physics (81st ed.). CRC press. ISBN 0-8493-0485-7. 1 2 "Chemical reactions of Samarium". Webelements. Retrieved 2009-06-06. ↑ Vohra, Y; Akella, Jagannadham; Weir, Sam; Smith, Gordon S. (1991). "A new ultra-high pressure phase in samarium". Physics Letters A. 158: 89. Bibcode:1991PhLA..158...89V. doi:10.1016/0375-9601(91)90346-A. 1 2 Leger, J; Yacoubi, N; Loriers, J (1981). 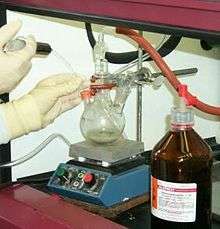 "Synthesis of rare earth monoxides". Journal of Solid State Chemistry. 36 (3): 261. Bibcode:1981JSSCh..36..261L. doi:10.1016/0022-4596(81)90436-9. 1 2 3 Gouteron, J; Michel, D.; Lejus, A.M.; Zarembowitch, J. (1981). "Raman spectra of lanthanide sesquioxide single crystals: Correlation between A and B-type structures". Journal of Solid State Chemistry. 38 (3): 288. Bibcode:1981JSSCh..38..288G. doi:10.1016/0022-4596(81)90058-X. ↑ Daou, J; Vajda, P; Burger, J (1989). "Low temperature thermal expansion in SmH2+x". Solid State Communications. 71 (12): 1145. Bibcode:1989SSCom..71.1145D. doi:10.1016/0038-1098(89)90728-X. ↑ Dolukhanyan, S (1997). "Synthesis of novel compounds by hydrogen combustion". Journal of Alloys and Compounds. 253–254: 10. doi:10.1016/S0925-8388(96)03071-X. ↑ Zavalii, L. V.; Kuz'ma, Yu. B.; Mikhalenko, S. I. (1990). "Sm2B5 boride and its structure". Soviet Powder Metallurgy and Metal Ceramics. 29 (6): 471. doi:10.1007/BF00795346. 1 2 Cannon, J; Cannon, D; Tracyhall, H (1977). "High pressure syntheses of SmB2 and GdB12". Journal of the Less Common Metals. 56: 83. doi:10.1016/0022-5088(77)90221-1. ↑ Etourneau, J; Mercurio, J; Berrada, A; Hagenmuller, P; Georges, R; Bourezg, R; Gianduzzo, J (1979). 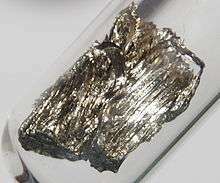 "The magnetic and electrical properties of some rare earth tetraborides". Journal of the Less Common Metals. 67 (2): 531. doi:10.1016/0022-5088(79)90038-9. 1 2 Solovyev, G. I.; Spear, K. E. (1972). "Phase Behavior in the Sm-B System". Journal of the American Ceramic Society. 55 (9): 475. doi:10.1111/j.1151-2916.1972.tb11344.x. ↑ Schwetz, K; Ettmayer, P; Kieffer, R; Lipp, A (1972). "Über die Hektoboridphasen der Lanthaniden und Aktiniden". Journal of the Less Common Metals. 26: 99. doi:10.1016/0022-5088(72)90012-4. 1 2 3 Spedding, F. H.; Gschneidner, K.; Daane, A. H. (1958). "The Crystal Structures of Some of the Rare Earth Carbides". Journal of the American Chemical Society. 80 (17): 4499. doi:10.1021/ja01550a017. 1 2 3 4 Greis, O (1978). "Über neue Verbindungen im system SmF2_SmF3". Journal of Solid State Chemistry. 24 (2): 227. Bibcode:1978JSSCh..24..227G. doi:10.1016/0022-4596(78)90013-0. 1 2 Meyer, G; Schleid, T (1986). "The metallothermic reduction of several rare-earth trichlorides with lithium and sodium". Journal of the Less Common Metals. 116: 187. doi:10.1016/0022-5088(86)90228-6. ↑ Zachariasen, W. H. (1948). "Crystal chemical studies of the 5f-series of elements. I. New structure types". Acta Crystallographica. 1 (5): 265. doi:10.1107/S0365110X48000703. ↑ Asprey, L. B.; Keenan, T. K.; Kruse, F. H. (1964). "Preparation and Crystal Data for Lanthanide and Actinide Triiodides". Inorganic Chemistry. 3 (8): 1137. doi:10.1021/ic50018a015. ↑ Brown, R; Clark, N.J. (1974). "Composition limits and vaporization behaviour of rare earth nitrides". Journal of Inorganic and Nuclear Chemistry. 36 (11): 2507. doi:10.1016/0022-1902(74)80462-8. 1 2 Meng, J; Ren, Yufang (1991). "Studies on the electrical properties of rare earth monophosphides". Journal of Solid State Chemistry. 95 (2): 346. Bibcode:1991JSSCh..95..346M. doi:10.1016/0022-4596(91)90115-X. 1 2 Beeken, R.; Schweitzer, J. (1981). "Intermediate valence in alloys of SmSe with SmAs". Physical Review B. 23 (8): 3620. Bibcode:1981PhRvB..23.3620B. doi:10.1103/PhysRevB.23.3620. ↑ Jayaraman, A.; Narayanamurti, V.; Bucher, E.; Maines, R. (1970). "Continuous and Discontinuous Semiconductor-Metal Transition in Samarium Monochalcogenides Under Pressure". Physical Review Letters. 25 (20): 1430. Bibcode:1970PhRvL..25.1430J. doi:10.1103/PhysRevLett.25.1430. ↑ Baernighausen, H.; Haschke, John M. (1978). "Compositions and crystal structures of the intermediate phases in the samarium-bromine system". Inorganic Chemistry. 17: 18. doi:10.1021/ic50179a005. ↑ Beck, H. P. (1979). "Hochdruckmodifikationen der Diiodide von Sr., Sm und Eu. Eine neue PbCl2-Variante?". Zeitschrift für anorganische und allgemeine Chemie. 459: 81. doi:10.1002/zaac.19794590108. ↑ Beck, H. P.; Gladrow, E. (1979). "Zur Hochdruckpolymorphie der Seltenerd-Trihalogenide". Zeitschrift für anorganische und allgemeine Chemie. 453: 79. doi:10.1002/zaac.19794530610. 1 2 Nickerson, J.; White, R.; Lee, K.; Bachmann, R.; Geballe, T.; Hull, G. (1971). "Physical Properties of SmB6". Physical Review B. 3 (6): 2030. Bibcode:1971PhRvB...3.2030N. doi:10.1103/PhysRevB.3.2030. ↑ Nyhus, P.; Cooper, S.; Fisk, Z.; Sarrao, J. (1995). "Light scattering from gap excitations and bound states in SmB6". Physical Review B. 52 (20): R14308. Bibcode:1995PhRvB..5214308N. doi:10.1103/PhysRevB.52.R14308. ↑ Sera, M.; Kobayashi, S.; Hiroi, M.; Kobayashi, N.; Kunii, S. (1996). "Thermal conductivity of RB6 (R=Ce, Pr, Nd, Sm, Gd) single crystals". Physical Review B. 54 (8): R5207. Bibcode:1996PhRvB..54.5207S. doi:10.1103/PhysRevB.54.R5207. ↑ Botimer, J.; Kim; Thomas; Grant; Fisk; Jing Xia (2012). "Robust Surface Hall Effect and Nonlocal Transport in SmB6: Indication for an Ideal Topological Insulator". Scientific Reports. 3 (3150). arXiv:1211.6769 . doi:10.1038/srep03150. ↑ Zhang, Xiaohang; Butch; Syers; Ziemak; Greene; Paglione (2012). "Hybridization, Correlation, and In-Gap States in the Kondo Insulator SmB6". Physical Review X. 3 (1): 011011. arXiv:1211.5532 . Bibcode:2013PhRvX...3a1011Z. doi:10.1103/PhysRevX.3.011011. ↑ Wolgast, Steven; Kurdak, Cagliyan; Sun, Kai; et al. (2012). "Low-temperature surface conduction in the Kondo insulator SmB6". Physical Review B. 88 (18). arXiv:1211.5104 . doi:10.1103/PhysRevB.88.180405. ↑ Gladyshevskii, E. I.; Kripyakevich, P. I. (1965). "Monosilicides of rare earth metals and their crystal structures". Journal of Structural Chemistry. 5 (6): 789. doi:10.1007/BF00744231. ↑ Smith, G. S.; Tharp, A. G.; Johnson, W. (1967). "Rare earth–germanium and –silicon compounds at 5:4 and 5:3 compositions". Acta Crystallographica. 22 (6): 940. doi:10.1107/S0365110X67001902. ↑ Evans, William J.; Hughes, Laura A.; Hanusa, Timothy P. (1986). "Synthesis and x-ray crystal structure of bis(pentamethylcyclopentadienyl) complexes of samarium and europium: (C5Me5)2Sm and (C5Me5)2Eu". Organometallics. 5 (7): 1285. doi:10.1021/om00138a001. 1 2 3 4 Audi, G; Bersillon, O.; Blachot, J.; Wapstra, A.H. (2003). "The NUBASE evaluation of nuclear and decay properties" (PDF). Nuclear Physics A. 729: 3. Bibcode:2003NuPhA.729....3A. doi:10.1016/j.nuclphysa.2003.11.001. ↑ Delafontaine, Marc (1878). "Sur le décepium, métal nouveau de la samarskite". Journal de pharmacie et de chimie. 28: 540. ↑ Delafontaine, Marc (1878). "Sur le décepium, métal nouveau de la samarskite". Comptes rendus hebdomadaires. 87: 632. ↑ De Laeter, J. R.; Böhlke, J. K.; De Bièvre, P.; et al. (2003). "Atomic weights of the elements. Review 2000 (IUPAC Technical Report)". Pure and Applied Chemistry. IUPAC. 75 (6): 683–800. doi:10.1351/pac200375060683. ↑ Delafontaine, Marc (1881). "Sur le décipium et le samarium". Comptes rendus hebdomadaires. 93: 63. 1 2 3 Samarium: History & Etymology. Elements.vanderkrogt.net. Retrieved on 2013-03-21. ↑ Boisbaudran, Lecoq de (1879). "Recherches sur le samarium, radical d'une terre nouvelle extraite de la samarskite". Comptes rendus hebdomadaires des séances de l'Académie des sciences. 89: 212–214. ↑ Coplen, T. B.; Peiser, H. S. (1998). "History of the recommended atomic-weight values from 1882 to 1997: A comparison of differences from current values to the estimated uncertainties of earlier values (Technical Report)". Pure and Applied Chemistry. 70: 237. doi:10.1351/pac199870010237. 1 2 What are their prices?, Lynas corp.
↑ "Rare Earths" (PDF). United States Geological Surves. January 2010. Retrieved 2010-12-10. ↑ "Monazite-(Sm): Monazite-(Sm) mineral information and data". Mindat.org. Retrieved 2016-03-04. ↑ "Florencite-(Sm): Florencite-(Sm) mineral information and data". Mindat.org. Retrieved 2016-03-04. ↑ Hajra, S.; Maji, B.; Bar, S. (2007). "Samarium Triflate-Catalyzed Halogen-Promoted Friedel-Crafts Alkylation with Alkenes". Org. Lett. 9 (15): 2783–2786. doi:10.1021/ol070813t. ↑ Cotton, F. Albert; Wilkinson, Geoffrey; Murillo, Carlos A.; Bochmann, Manfred (2007). Advanced inorganic chemistry (6th ed.). Wiley-India. p. 1128. ISBN 81-265-1338-1. ↑ "Centerwatch About drug Quadramet". Retrieved 2009-06-06. ↑ Pattison, John E (1999). "Finger doses received during 153Sm injections". Health physics. 77 (5): 530–5. doi:10.1097/00004032-199911000-00006. PMID 10524506. ↑ Finlay, IG; Mason, MD; Shelley, M (2005). "Radioisotopes for the palliation of metastatic bone cancer: a systematic review". The lancet oncology. 6 (6): 392–400. doi:10.1016/S1470-2045(05)70206-0. PMID 15925817. ↑ DOE Fundamentals Handbook: Nuclear Physics and Reactor Theory (PDF). U.S. Department of Energy. January 1993. pp. 34, 67. Archived from the original (PDF) on March 22, 2009. ↑ phys.org. "45-year Physics Mystery Shows a Path to Quantum Transistors". phys.org. phys.org. Retrieved Dec 8, 2014. ↑ Sorokin, P. P. (1979). "Contributions of IBM to Laser Science—1960 to the Present". IBM Journal of Research and Development. 23 (5): 476. doi:10.1147/rd.235.0476. ↑ Zhang, J. (1997). "A Saturated X-ray Laser Beam at 7 Nanometers". Science. 276 (5315): 1097. doi:10.1126/science.276.5315.1097. ↑ Kaminskii, V. V.; Solov’ev, S. M.; Golubkov, A. V. (2002). "Electromotive Force Generation in Homogeneously Heated Semiconducting Samarium Monosulfide". Technical Physics Letters. 28 (3): 229. Bibcode:2002TePhL..28..229K. doi:10.1134/1.1467284. ↑ Baur, F.; Katelnikovas, A.; Sazirnakovas, S.; Jüstel, T. (2014). "Synthesis and Optical Properties of Li3Ba2La3(MoO4)8:Sm3+". Zeitschrift für Naturforschung. 69b (2): 183–192. doi:10.5560/ZNB.2014-3279. ↑ Riesen, Hans; Kaczmarek, Wieslaw (August 2, 2007). "Efficient X-ray Generation of Sm2+ in Nanocrystalline BaFCl/Sm3+: a Photoluminescent X-ray Storage Phosphor". Inorganic Chemistry. 46 (18): 7235. doi:10.1021/ic062455g. ↑ Liu, Zhiqiang; Stevens-Kalceff, Marion; Riesen, Hans (March 16, 2012). "Photoluminescence and Cathodoluminescence Properties of Nanocrystalline BaFCl:Sm3+ X-ray Storage Phosphor". Journal of Physical Chemistry C. 116 (14): 8322–8331. doi:10.1021/jp301338b. ↑ Wang, Xianglei; Liu, Zhiqiang; Stevens-Kalceff, Marion; Riesen, Hans (August 12, 2014). "Mechanochemical Preparation of Nanocrystalline BaFCl Doped with Samarium in the 2+ Oxidation State". Inorganic Chemistry. 53 (17): 8839–8841. doi:10.1021/ic500712b.